How Much Better Would Life Be with 20X More Productivity? If you’ve accepted the challenge that the 20X principle places in front of you—the challenge to prove that you are capable of accomplishing 20 times more, the inevitable question arises: How? And what’s the first step to moving down that path? How do you power up to accelerate to a level of achievement that is both daunting and, for most, is left unchallenged as downright impossible? In my next series of Blog posts and podcasts, I plan to discuss strategies and tools to help you jump into the 20X jet stream. In this introductory post, I would like to discuss a mainstay of our contemporary lifestyle, the smartphone. Does this magnificent creation of Steve Jobs’ lead to greater productivity or greater distraction? When it comes to taking on a project that you would love to get done today, is your phone a tool that you use effectively for scheduling, communications, and overall time-management? Or does the lure of instant messaging, on-demand video and social media tug away your attention from the important but not urgent tasks, ultimately wasting large chunks of your day? A recent survey conducted with 2,200 HR managers showcased the dark side that comes with the modern technology. Smart phones are proving to be a key to a growing problem of “lower-quality work, lost revenue, missed deadlines, deteriorating management-employee relations and lower morale when other workers have to pick up the slack.” That is pretty scary. 1. A morning ritual of 15 minutes that includes breath control, positivity and a check-in with your personal ethos. A short mindful movement routine and a dirt dive of your day to close it out. This sets the stage to win the day in your mind, before you step out the door. 2. Before your SEALFIT WOD, conduct another 5 minutes or so of Box Breathing and then dirt dives your plan (visualize it). This is a short version of the pre-training SOP. After the WOD do 5 minutes of mobility drills (i.e. : our hip mobility or just some simple yoga stretches) and mentally review the WOD and learn from it. This is a simplified version of the post-training SOP. See my book 8 Weeks to SEALFIT for more great insights on how to train your five mountains through your physical regimen. 3. During the day, practice positivity and mental control with the ‘Feed the Courage Wolf’ drill. Do this by periodically checking in to your mental state, and reciting a power mantra to ensure you are remaining positive and present. 4. Instead of going out to lunch, use that time to do some mental or physical training. 5. Take a power break mid-afternoon to re-charge your batteries and calm your mind with a spot drill. A spot drill can be 10-minutes of Box Breathing, some sun salutations or a brief still-water runs deep visualization. 6. Practice a ‘news blackout’ in the evening. Turn off your phone and TV. Instead, feed your mind with a good book, or play a board game, or simply enjoy a good conversation. 8. Before bed, conduct a short evening ritual, including Box Breathing and a visual recapitulation of your day. This set of powerful actions, when habituated, will set you on a course for achieving your next 20X breakthrough, and when practiced with discipline and sincerity, will change your life. Stay tuned for more ideas to develop a 20X productivity mindset. 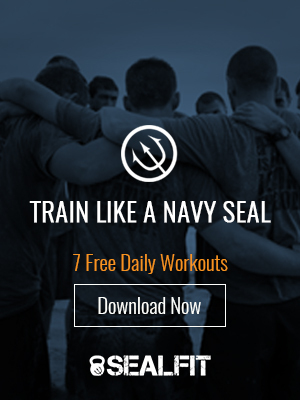 PS: We want to thank you all for your amazing support and dedication to the SEALFIT Unbeatable Mind lifestyle. And as we turn inward to focus on our families in Thanksgiving next week, let’s send some healing energy to our friends in France. In addition, I challenge you to activate your warrior mindset, remaining alert so you can help detect, deter and defeat those who would dare bring terror to our community.